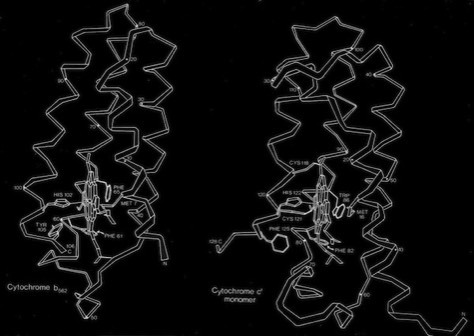 The protein structures examined in the original description of the 4-alpha helical bundle motif in 1980 manifest little apparent sequence homology and were generally constructed of relatively short alpha helices. Nevertheless, it was clear that the most compact arrangement of 4 alpha helices with similar lengths and short interconnections was an antiparallel bundle. 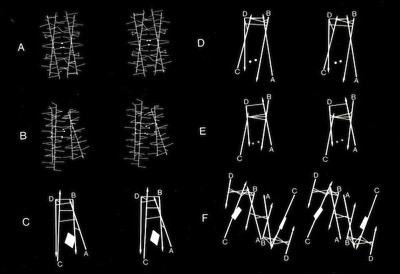 The most symmetric arrangements had an “hourglass” shape with points of closest inter-helical approach at the centers of each helix. 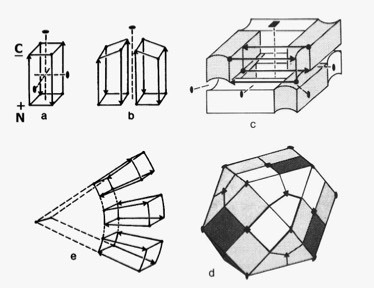 However, most observed structures had a point of closest interhelical approach at one end of the bundle, making them wedge-shaped. 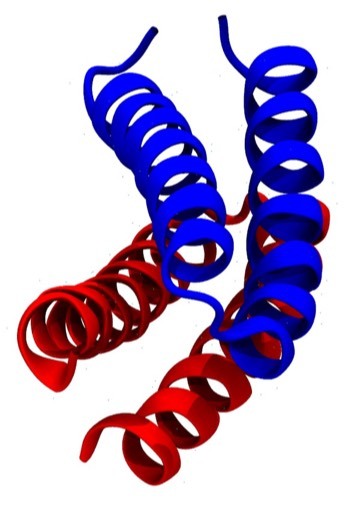 The more symmetric 4-alpha helical bundle arrangements, with an “hourglass” shape, were suited for packing into correspondingly symmetric superstructures like ferritin. 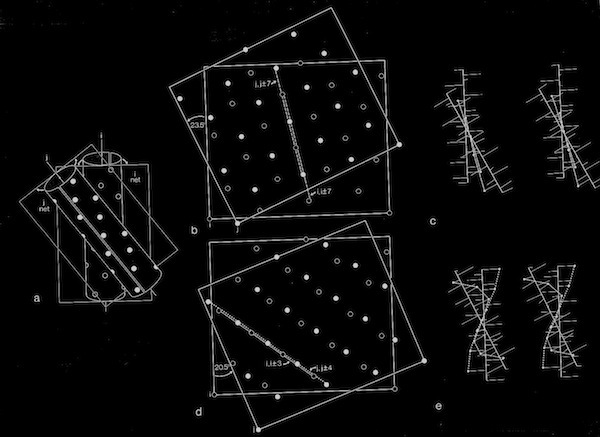 Structures with the point of interhelix closest approach at one end of the bundle that were wedge-shaped could pack to form discs or helical arrays such as found in TMV. 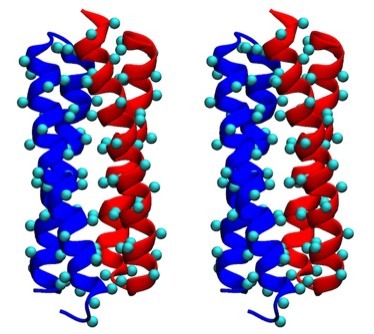 Alternately, the divergent end of a wedge-shaped bundle could form an internal ligand binding site, as it did for cytochrome b562 and cytochrome c-prime. 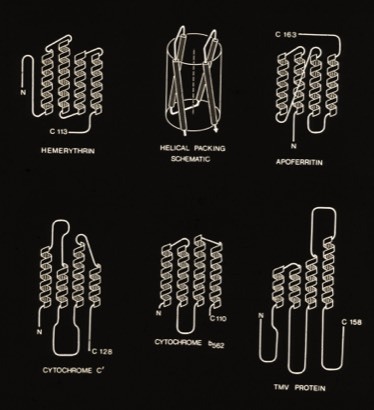 Assessments of alpha helix packing in proteins were developed as an extension of the original “knobs-into-holes” model for alpha-helical coiled coils originally advanced by Crick in 1953 in order to develop models for geometrically preferred interhelical interactions. 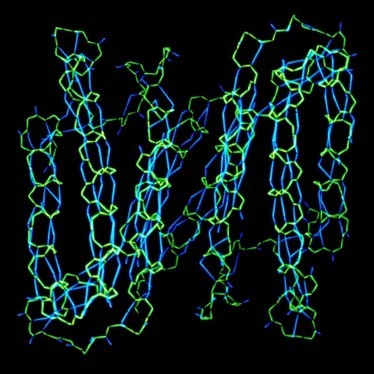 The approach basically involved finding alternative superpositions of two alpha helix nets that could reflect possible patterns of periodic interdigitization of the side chains of the two alpha helices. 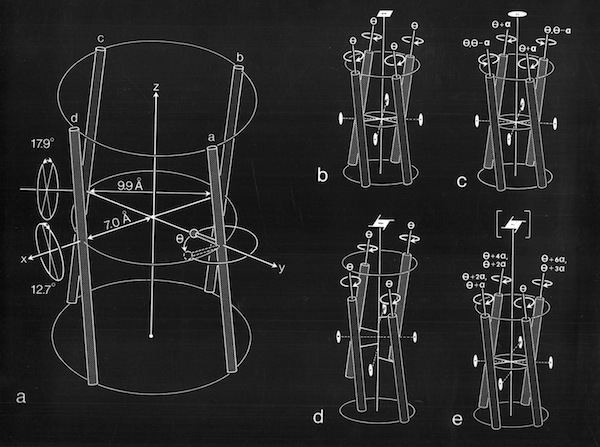 The approach only provides an approximation for straight alpha helices which rapidly diverge from their points of closest approach in 4-helical bundles. 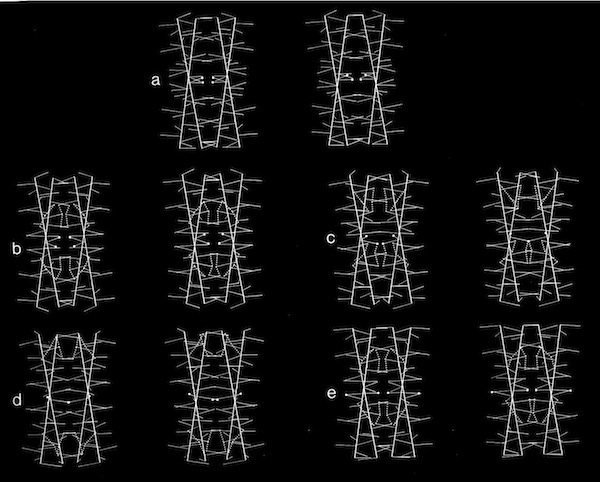 For interactions between straight helices, that can be alternative patterns of local side chain interdigitation at interhelical angles of ~20 degrees as seen in 4-alpha helical bundles. 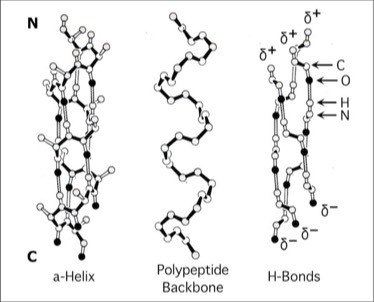 Models of helix interactions in 4-alpha helical bundles at ~18-20 degrees admit a variety of possible bundle pseudosymmetries and corresponding interhelical packing interactions, many of which incorporate localized favorable packing interactions. 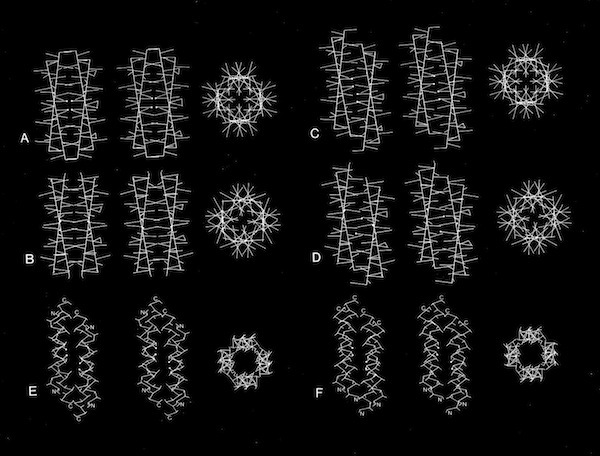 The frequency of recurrence of the 4-alpha helix bundle motif evidently stems from the great variety of alternatively packed arrangements that can nevertheless form locally favorable packing interactions within a common overall geometrical framework. 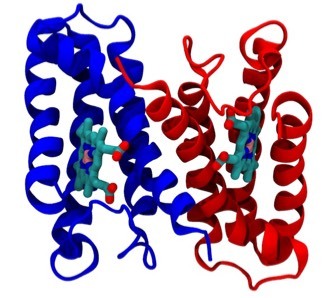 The cytochrome b562 from E. coli was observed to be a 4-alpha helical bundle protein with architecture similar to monomer of the cytochrome c-prime derived from the photosynthetic bacterium Rhodopseudomas molischianum. 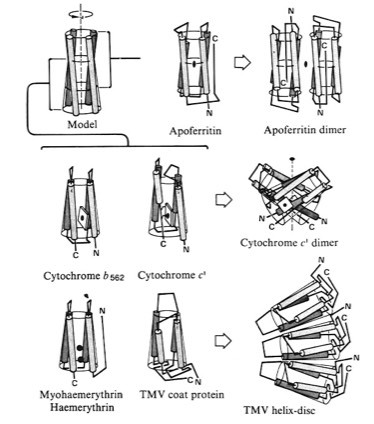 This was a bit surprising since the protoporphyrin IX heme group in cytochrome c-prime is covalently connected to the polypeptide backbone through thioether linkages to protein cysteine groups (a defining property of c-type cytochromes), whereas the heme was non-covalently bound in cytochrome b 562. 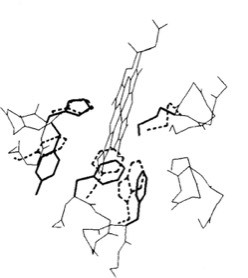 Nevertheless, a least square superposition of the heme groups in the two structures showed a surprising correspondence between the both the alpha helical frameworks of the two structures as well as the situation of several aromatic amino acid side chains surrounding the heme groups. Is this a manifestation of convergent or divergent evolution? The contiguous H-bond networks that stabilize the alpha helical conformation create a helical macrodipole. 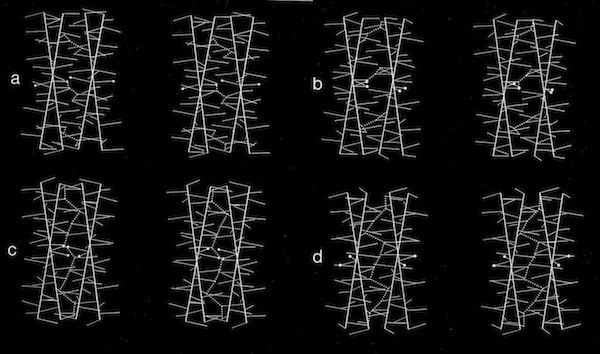 In a collaborative study with Bob Sheridan and Ron Levy, interaction of the helix macrodipoles were determined to be an energetically favorable contributor to the antiparallel helix arrangements found both in 4-alpha helical bundle proteins and their aggregated superstructures.